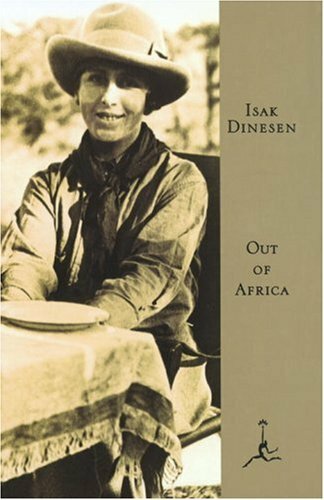 Karen Blixen lived on a farm in Africa for almost twenty years. She came out to live with her husband, but they divorced in 1925 and Karen was the owner of the farm for the remaining years. She tells about the daily life on the farm and its many squatters and their guests. Although it is a biography, it is never personal. It rather focuses on the farm, instead of Karen’s personal life, which I think is a pity. I was lucky to find a short biography attached to the copy I bought at a market in Oslo, and she certainly lived a fascinating life, and I would love to read more about it. I really enjoyed reading about the farm and the joys and hardships of the people who were involved. She writes with great insight and it is a joy to read about the landscape and wild life surrounding the farm. This is the way I wish an other book about an African farm was written (the Conservationist by Nadine Gordimer). But one chapter in the book annoyed me – instead of following the pattern of the other chapters, this one was full of short stories in no chronological order and many seemed written down just to be remembered and had little to do with the rest of the book. I skimmed many of them as I saw no point in them being there in the first place. I’m looking forward to watching the film version of this once I’m united with my tv again.